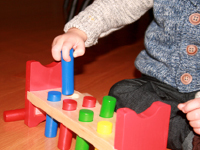 For several years now, we have been filling our daycares and playrooms with plastic toys. 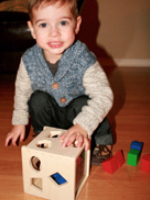 Wooden toys were somehow set aside and we have favoured toys that are not made with natural materials. 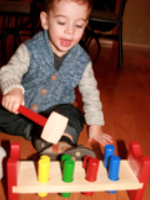 The texture of wooden toys is warm and interesting for little hands. For this reason, many early childhood educators are once again starting to present them within their group. On the educatall.com online store, you will find a wide range of quality wooden toys that will make great additions to your toy collection. In this article, I would like to share the results of two toy tests that were executed with Philipp, who is 22 months old. Both toys involve the insertion of shapes and boast bright colors. This is the toy Philipp preferred among the two toys that were tested here. Personally, I must say it is my favorite also. I like toys that don't require constant adult assistance and encourage simple yet fun manipulations. Children must simply tap the wooden pegs through the holes. 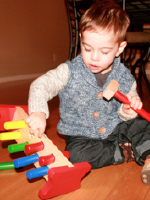 The toy includes a hammer and eight (8) colourful wooden pegs. Most of the time, Philipp enjoyed pushing down on the pegs and exploring them with his hands. In the weeks that followed our initial toy test, I also tested this toy with a group of children between the ages of 16 months and 2 years old. They all preferred using their hands instead of the hammer. 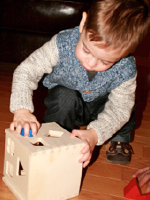 Once the wooden pegs were pressed through the holes, Philipp would simply turn the toy over and start all over again. The manufacturer recommends this toy for children who are 2 years old or older. Philipp is 22 months old and after also testing the toy with children ages 16 months to 2 years old, I feel that young toddlers can definitely appreciate and use this toy. I therefore recommend it for your group of children. The goal is to press each of the twelve shapes through the hole of the same shape, open the door, remove the shapes, and start over again. When Philipp first began exploring the toy, he was very good. He successfully inserted several shapes without experiencing any difficulty. He was however less interested in this toy. I think this may be because some of the shapes are more difficult to insert. I also tested this toy with the group of children between the ages of 16 months and 2 years old. They appreciated the toy, but required adult assistance for the insertion of certain shapes. The manufacturer recommends this toy for children who are 2 years old or older. In my opinion, this toy is for much older children. Certain shapes (circle, star, flower, square) can easily be inserted by 2-year-olds. 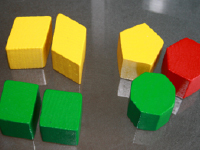 However, since several shapes are very similar, sorting and inserting them is challenging even for older children (see picture showing similar shapes below). Of course, if an adult is able to assist children, the toy is highly interesting. In spite of the pleasant appearance of the toy and even if the children it was tested with were attracted to it, I do not recommend it for young toddlers. It is better suited for children who will be able to explore and manipulate it independently. Consider the following when selecting a toy that involves sorting and inserting shapes for children who are 2 years old or older. To encourage autonomous exploration, look at the number of shapes. 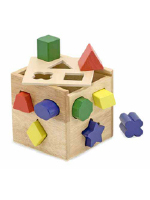 This toy contains 12 shapes. In my opinion, there are too many shapes for young children. Check to see if the shapes can easily be inserted. Circles, squares, and stars represent ideal shapes for two-year-olds. Verify if the door used to remove the sorted shapes is easy to open so that children can repeatedly use the toy on their own. Thank you to Philipp for testing these toys with me. Educatall.com kindly gave him the Pound-a-peg toy.